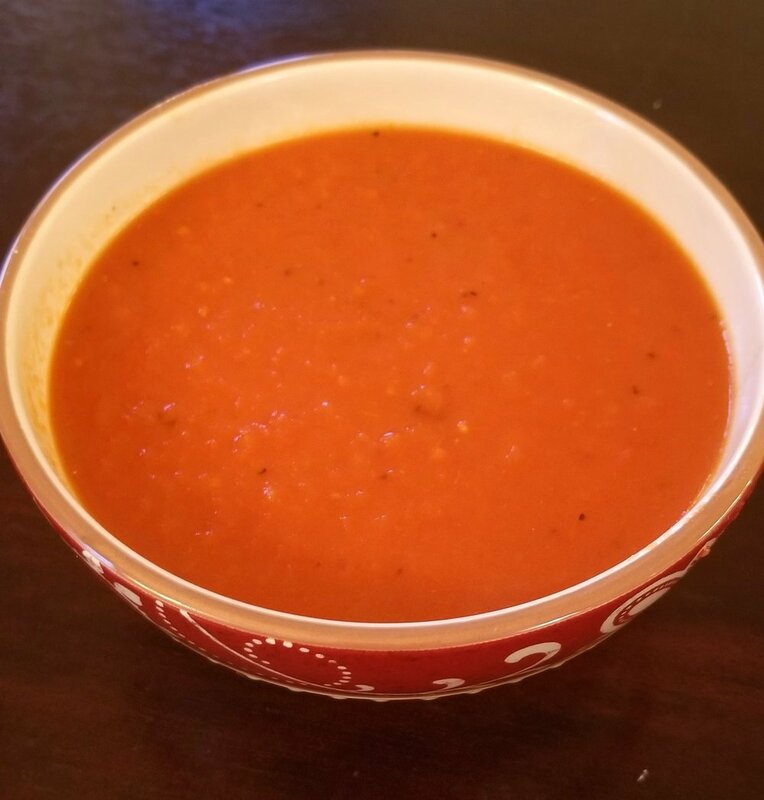 Meal Notes: This is my own version of tomato soup, incorporating elements from the healthiest and most delicious recipes I’ve tried over the years. For me, this combination of ingredients strikes the ideal balance of flavorful and wholesome. It probably goes without saying that the ideal accompaniment for this soup is a grilled cheese sandwich. * It also pairs well with a salad. or corn cakes. Prep: Cut tomatoes in half. Peel and quarter the onions. Line two baking sheets with aluminum foil. Preheat oven to 350 degrees F.
Roast vegetables: Place tomatoes and onions with 5 unpeeled garlic cloves in a large bowl. Drizzle with olive oil and mix until vegetables are covered. Pour vegetables onto the two prepared baking sheets. Sprinkle with 2 teaspoons of the salt. Place sheets in preheated oven and roast vegetables for about 30 minutes, until soft and lightly browned. Puree vegetables: Remove garlic cloves from their skins (they should pop out easily after roasting). Add garlic, tomatoes, and onion into a blender and puree in batches. (Alternately, you can pour the vegetables into a large bowl and puree all at once with an immersion blender.) Add the tomato paste and continue blending. When finished, pour your tomato puree into a large pot and place over medium heat. Make the soup: Add vegetable stock to tomato puree and gently simmer until soup is heated through. Season with celery seeds, honey, heavy cream, remaining salt, and pepper. Taste and adjust seasoning to your preference. Start with slices from a good loaf of bakery bread (my preference is sourdough) and your favorite cheese, shredded or crumbled for faster melting (I use a mix of shredded sharp cheddar and crumbled goat cheese). Take a slice of bread and spread some mayonnaise (about 2 teaspoons) on one side. You won’t be able to taste the mayonnaise after the sandwich is done (at least I can’t!) and I prefer it over butter because it’s less greasy and also seems to help the bread toast more easily and evenly. Place the bread mayonnaise-side-down in a heated frying pan. Carefully place some cheese on top of this slice, taking care not to overfill or spill into the frying pan. Spread another 2 teaspoons of mayonnaise on one side of another slide of bread and place this slice mayonaisse-side up on top of the cheese. Press down on the sandwich with your spatula. After about a minute, flip and repeat. Remove to a plate when the cheese is melted and the bread is toasted brown.